Behind the Scenes - Ben Affleck and Richard Linklater. (Credit: Gramercy Pictures/Alphaville Films/Detour Filmproduction via Entertainment Weekly). 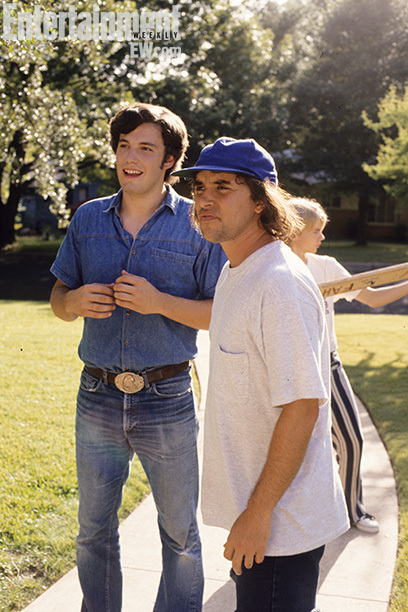 Wallpaper and background images in the Dazed and Confused club tagged: photo dazed and confused behind the scenes ben affleck richard linklater fred o'bannion. This Dazed and Confused photo might contain navegante, livorno, panamá, sombrero de panamá, marinero, espumadera, sombrero de paja, barquero, leghorn, sombrero panamá, skimmer, pantalones largos, pernera del pantalón, pata de pantalón, and pantleg.